May 1998 saw the end of Suharto's New Order. Real political opposition had surfaced, much of it centred around Megawati Sukarnoputri, the eldest daughter of the first president Sukarno. Suharto had engineered her removal as the popularly elected leader of PDI, one of the three 'authorised' political groupings. 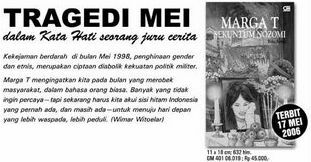 On July 27th 1996 there was a raid on her party HQ in central Jakarta. The heavy handedness, orchestrated from on high, resulted in deaths and disappearances. 'Er Indoors was trapped in a taxi at the front of the traffic jam during those events. The raid led to demonstrations and rioting around Jakarta during which buildings and vehicles were burnt and further clashes occurred between the security forces and demonstrators. The onset of the Asian Economic Crisis, known as krismon (from krisis monetar) in Indonesia, with punitive remedies recommended by the IMF, had further exacerbated the sense of unease and life under Suharto had become very precarious. Many expats left the country as they saw their earnings drastically reduced. Those of us with rupiah incomes and Indonesian famlies shrugged fatalistically and carried on with our lives. As elsewhere and at other times, the students continued at the forefront of the protests. The military and police, who were then under the same overall command, caused the 'disappearances' of several student activists. There is evidence that a rogue unit of Kopassus, army special forces, led by a son-in-law of Suharto, General Prabowo Subianto, was responsible. Such was the paranoia at that time that 'Er Indoors would whisper the latest gossip about Suharto and his family even when our doors were shut and I was playing an album loudly and the TV was on. As the events unfolded in May, live on TV, radio and in phone calls, I had a computer but no internet access. I was handwriting a letter to Son No.1, then pursuing his university studies in New Orleans. My letter turned from a parental missive into a commentary on what we were living through here in Jakartass Towers. My account would have made a great series of blogging posts – it's not that often that anyone, apart from journalists, can say that for a short while "I was there – or abouts". Following recent criticism of journalist Richard Parry's witness account of events, it is only proper that those of us who have a longer term perspective should contribute to the 'oral history' of the downfall of a dictatorship. This is the preamble to that account, an only slightly edited version of the ten foolscap pages that I wrote. Do read it in sequence and, perhaps, think of it as a mood poem. Also, please think of it as a work in progress as I'd like to add hyperlinks and photographs where appropriate. Below is a list of links to others who were witnesses. If there are any similar blogger accounts, please leave the link in the comment box below. Also, those of you wishing to record your memories are welcome to email me so I can post them directly or, again, post directly in my comment box. I was somewhere outside Yogyakarta on this day eight years ago, within sight of Mount Merapi volcano. One of the greatest democratic revolutions in history was about to erupt but I didn't know it then. … those were the days of thousands of young student moving to defy the thuggish Soeharto regime all by themselves. I had been going to the first demonstrations in March, taking photographs, to see for myself. Something big was going to happen, but I did not know what or when. Would we get shot? Would we get caught? Would the students throw the tinpot out? Ujang of Cafe Salemba has commented: The respected author Marga T has a new novel coming out this weekend, in which one of the main characters found herself in the middle of a rampage during the May 98 riots. If you're not familiar with her work, Marga T, who is a Chinese Indonesian, is one of the giants in the pop literature scene in the 80s. In the absence of official accounts or any closure about the tragedy, 8 years on, she said she's dedicating the novel to the victims. As an epilogue to your account would you like to update the above or repeat it? If the fatalistic sentiment was true of you and others in 1998 after such a sudden occasion why does the phrase sound to me more like you were on the verge off it anyway? If Im right what was the thing(s) in the first 10 years of your stay here that made you feel fatalistic? Marriage? The feeling of being a mere observer ~ tied to a salary, too old to be a student, not an Indonesian? But then, if you’ve been reading the Post recently, you’ll have noted how very few of those student activists have not been co-opted. Prominent public leaders, such as Amien Rais, were already part of the establishment. There was, in fact, no way that this revolution would see a fundamental shift in Indonesian life. There may be an electoral democracy now, but life isn’t any better for the majority, is it? I dont mean to trivialise feelings but the movie ‘The Year of Living Dangerously’ is evocative and interesting, perhaps superficial, set in the Indonesian unrest in the 60’s but helped along by Peter Weir et al and a rather young Sigourney W & Mel G.
Excellent stuff jakartass, I am thoroughly enjoying your (and Indcoup’s) recollections, I didn’t arrive in Jakarta for a few years after ’98 but even in far distant Blighty the story was penetrating my conciousness despite the fact that at that time I would have been unable to place Indonesia on a map if you’d paid me. It seems to me that for Jakarta people the events of May ’98 are a turning point that is still very fresh to this day. I get the impression that prior to then Jakarta was, for locals and expats alike, a thriving thrusting brash modern city where a certain carefree attitude existed. It came as a complete shock to discover that behind the bright shiny office blocks and shopping malls and all the grinning “hello meesters!” there lurked such primordial violence. Since those days Jakartans appear to be like the villagers around Mount Merapi; you still want to live on the slopes, it’s where your home is and it’s where you feel comfortable but you can’t ignore the constant rumblings and puffs of smoke, it’s in your conciousness all the time that some day you just might need to make a rapid exit. Or to mix my metaphors further the May ’98 riots are like an occasion when a friendly house trained pet dog suddenly turned and bit a big chunk out of your leg before resuming his slumber on the hearth rug. You still have him about the place, you still like him and you want to keep him, but you never forget what happened and at the back of your mind you wonder “could it happen again?”. My account is now up.